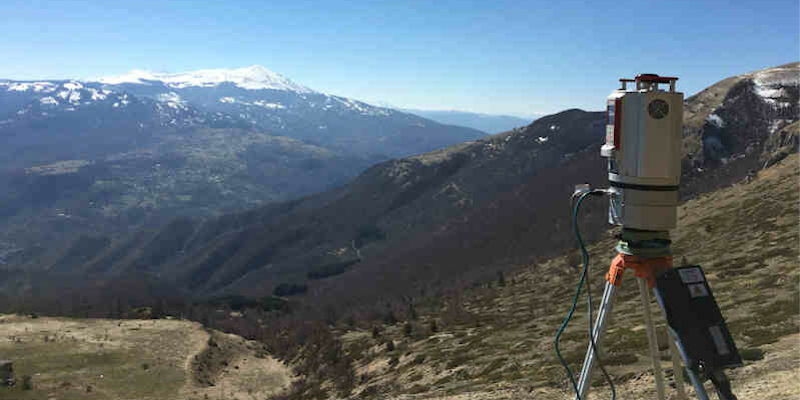 Overview: We have specialist equipment for topographic surveying, including a Reigl VZ-1000 terrestrial laser scanner and a Leica Viva dGPS-TS system. The Leica Viva GS14 is a compact and powerful Global Navigation Satellite System (GNSS) smart antenna, with integrated mobile communications and ultra-high frequency (UHF) modem. The smart antenna is equipped with intuitive software which has clear graphics, practical menu structures, accessible terminology and simplified workflow. The V-Line 3D Terrestrial Laser Scanner RIEGL VZ-1000 provides high speed, non-contact data acquisition for ranges from just a few metres up to 1400m using a narrow infrared laser beam and a fast scanning mechanism. The RIEGL VZ-1000 is a very compact and lightweight surveying instrument. It has an internal storage capacity of up to 32 Gbyte, an optional add-on rechargeable battery and a water and dirt resistant keypad. Applications are wide ranging, including topography, mining, architecture, archaeology, monitoring, civil engineering and city modelling.